Winter is upon us here in the southern hemisphere and I hate it. I am in no way a winter person and the only good thing about this time of year is how adorable I happen to look in winter coats (not to mention those boys in peacoats!). But the cold snap does have it uses – especially when planning a Frozen themed party or looking for the abominable snowman. If you want to keep those winter blues away, why not use one of the most basic elements of winter to throw a party that will warm your heart? Winter is all about the shades of grey. The snow is white, the sky is grey, the water is frozen solid into a clear or icy blue mass. Utilise these otherwise dreary nature of winter into something a bit more fun and upbeat by taking the frozen tones and channelling them into an on point winter colour scheme. Think light blue lights, shining clear diamond scatters, white twigs and branches in gleaming silver vases, and ice blue table runners on a crisp white tablecloth. If you nail the colour theme straight up, no one will dare see a winter themed party as being dreary! Snow is a big theming element for a winter themed party and utilising the intricate nature of a snowflake is a great way to draw the winter element into the finer points of your party. I love the idea of making it seem like your party is being snowed on and this can be done in several ways. 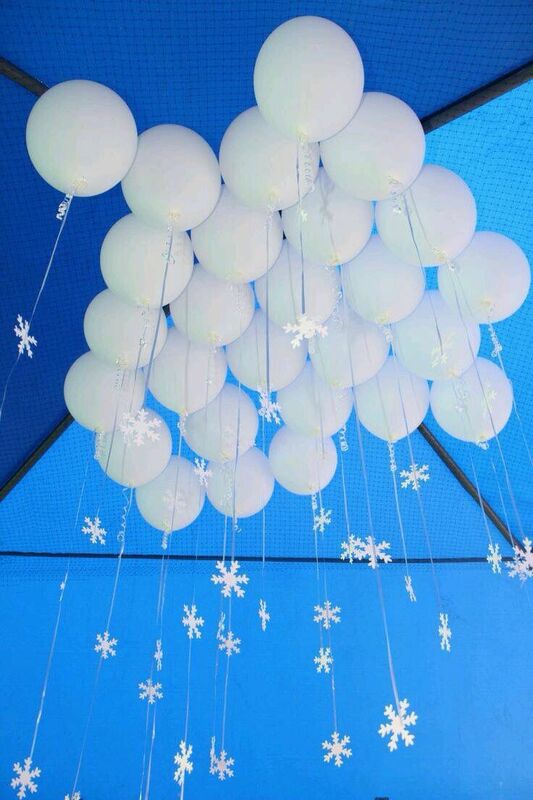 You can hang rows of paper cut or laser cut snowflake decorations or banners across the ceiling, or you can go a little bit extra and hang white paper ball lanterns on the ceiling or let helium balloons rise above your guests heads. This will add an extra crisp wintery effect, and fill the room with the same wonder you get when it snows. There is something magical and spooky about winter trees, with the leaves stripped off the branches and the icicles falling from the barren twigs. Add the winter to your next event by featuring these bare branches as the centrepiece to your next event. Collect some sticks and branches from outside, paint them white to add the extra wintery element and put them in a clear or ice blue coloured vase for your dessert table. You could also do what Biz Bash did above and make it a full blown decoration feature to really transform your next event into a winter wonderland! No party is ever complete without the food, and you always have to match your theme to your desserts. Think white chocolate covered pretzels, snow white vanilla cupcakes, melting marshmallow snowman cookies, ice blue snowflake cake pops and shaped cookies, and maybe even serving treats that have winters seal of approval – such as hot chocolates and candy canes. Yum yum! If you set your winter themed party to be a costume party then you need to be aware that there will be a million Anna’s and Elsa’s from Frozen – and maybe even a few Han’s. But if you get lucky someone might come in a full Abominable Snowman outfit and maybe a few Snowmen or Frosty’s. Think outside the box and you will be delighted at how these crazy characters can really bring a winter party to life!